It was a year I’m sure many would like to forget; it was disastrous for the planet AND her inhabitants. For me, on this last day of the year, I choose to reflect on the beauty, joy, love, and new adventures that I was fortunate to experience. I welcomed 2016 in the San Francisco Bay Area at my childhood home, now my younger son’s domicile. 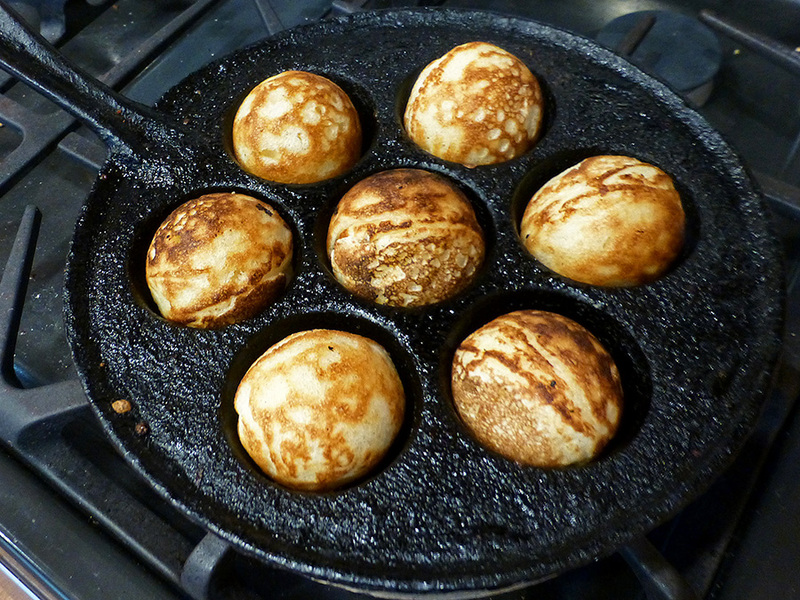 Thus on New Year’s Day, I made æbleskiver (Danish pancakes) using my great grandmother’s recipe and her, well over 100 year old, cast iron pan. Æbleskiver on New Year’s Day 2016; a family tradition. 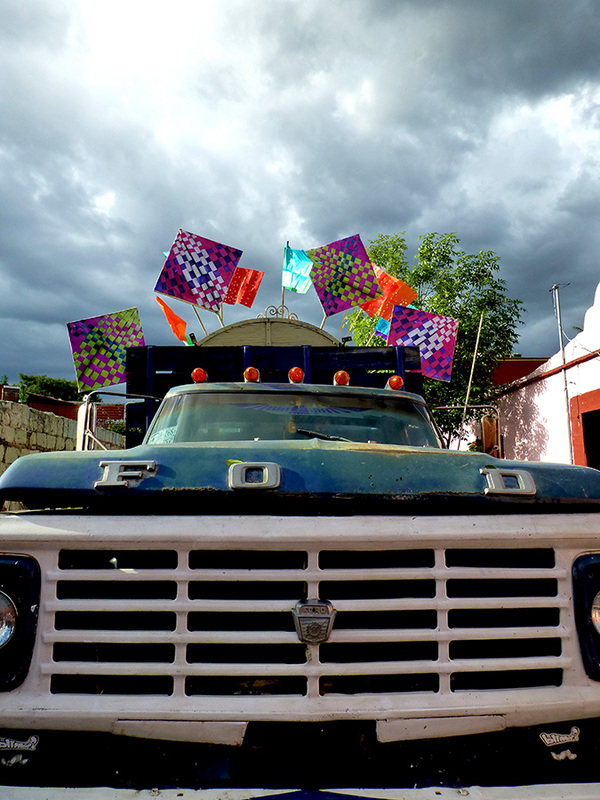 Back in Oaxaca, February brought a community Día de Amor y Amistad fiesta in my apartment complex. Have I mentioned? I have wonderful neighbors! 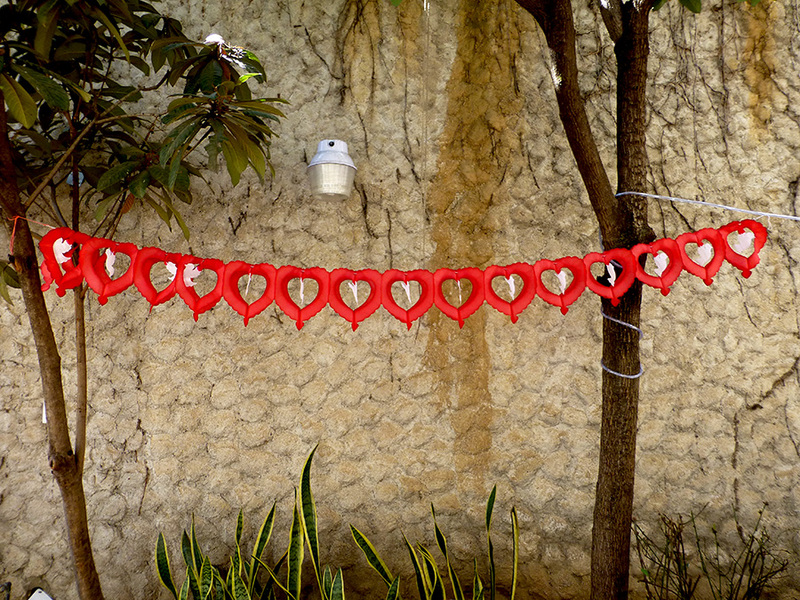 Valentine’s Day party decorations in the patio. March was unseasonably hot, but the blue skies and flamboyant trees beginning to bloom made it bearable. 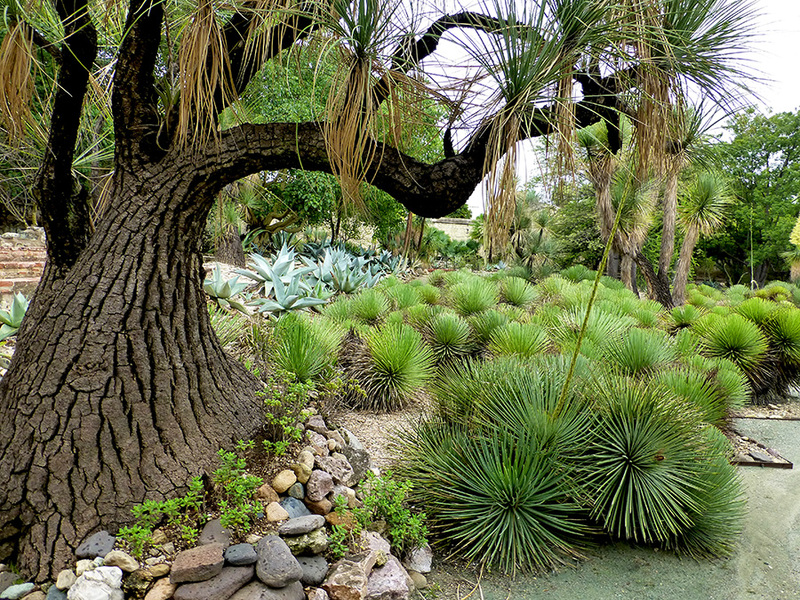 Flamboyant trees, Santo Domingo de Guzmán, and agave. April took me to Cuba, a lifelong dream finally realized. It was more fascinating, confounding, and fabulous than I had ever expected. 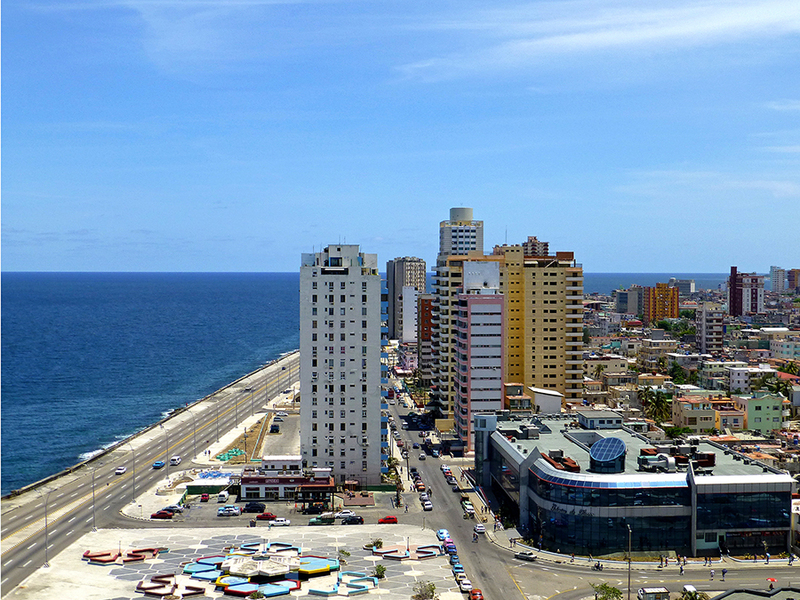 View from the Hotel Habana Riviera. 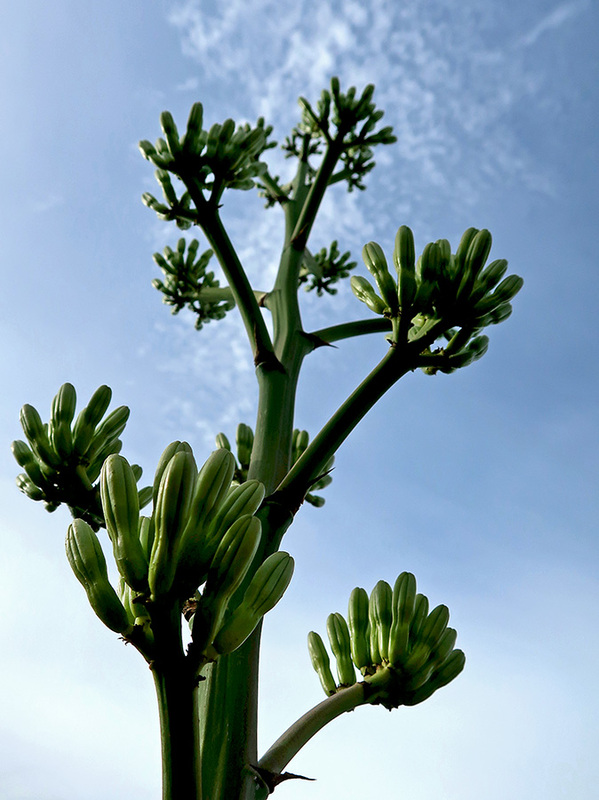 By May, the flamboyant trees had leafed out and were in full bloom — and we needed it, as the hot-hot-hot temperatures continued. 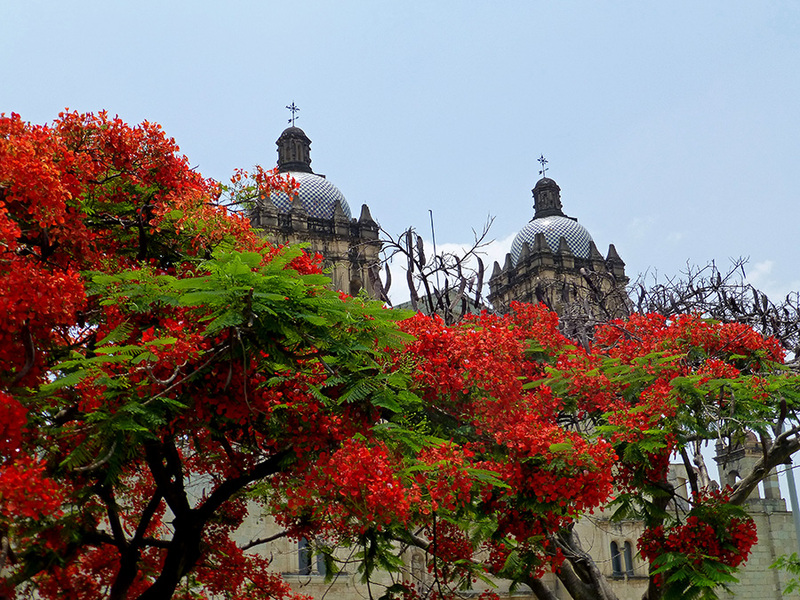 Flamboyant trees and Santo Domingo de Guzmán looking picture perfect. 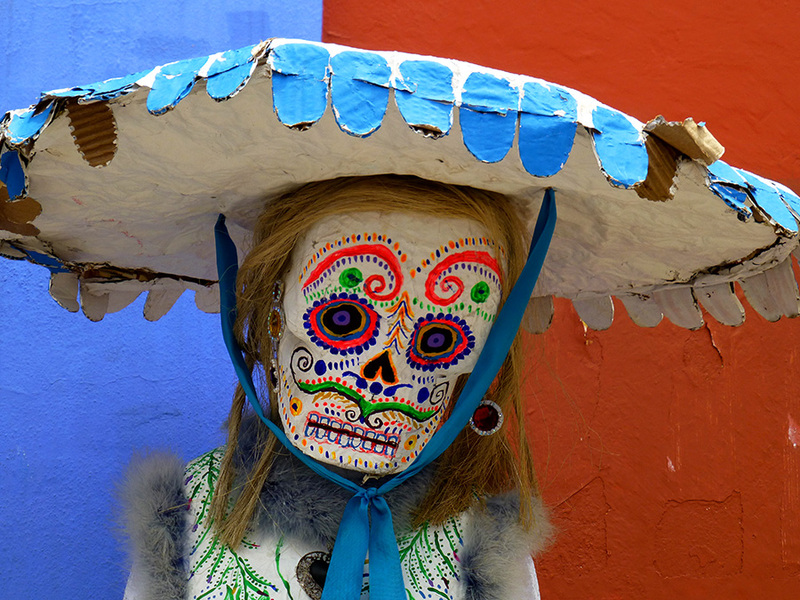 A calavera on the streets of Oaxaca in June? Absolutely! She knows no season. Sad calavera standing on the sidewalk. And, then there was July! 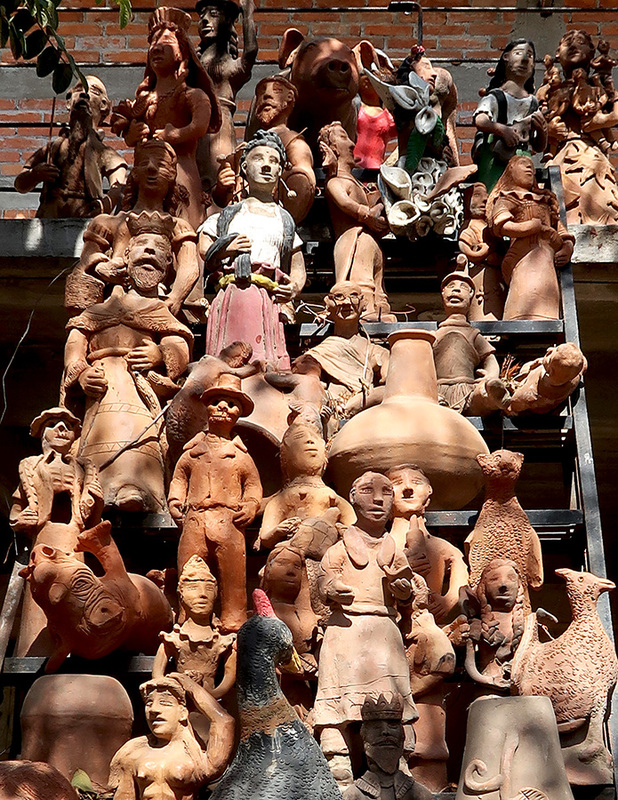 So much to see and do, this month warrants three images. Indigenous pipe and drums lead off the first, and stormy, Guelaguetza desfile. El Jardín Etnobotánico was again the site of the Mole Festival. So beautiful! Vela Vinnii Gaxheé parade float waiting for the Intrepidas to board. 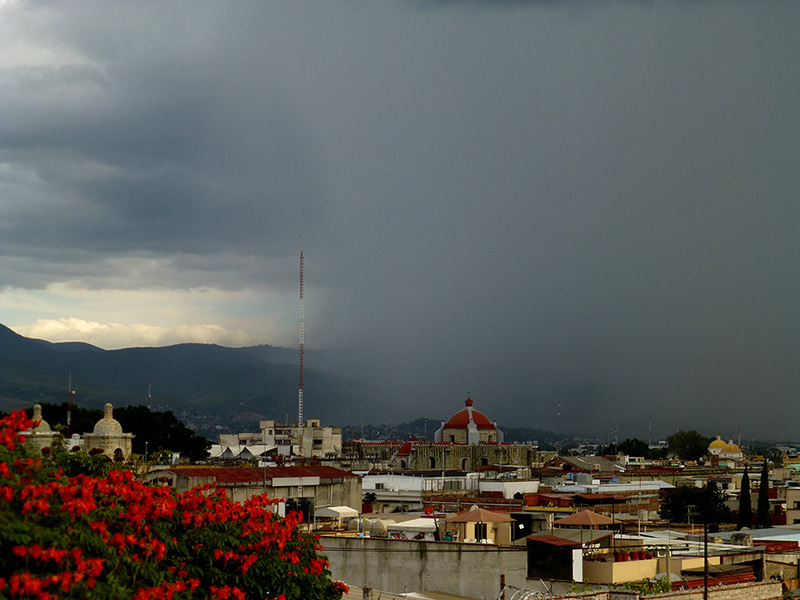 The rainy season was in full force in August and I loved standing on my terrace watching the storms approach, though sometimes they didn’t make it all the way to Casita Colibrí. Microclimates! Storm approaching the city from the south. 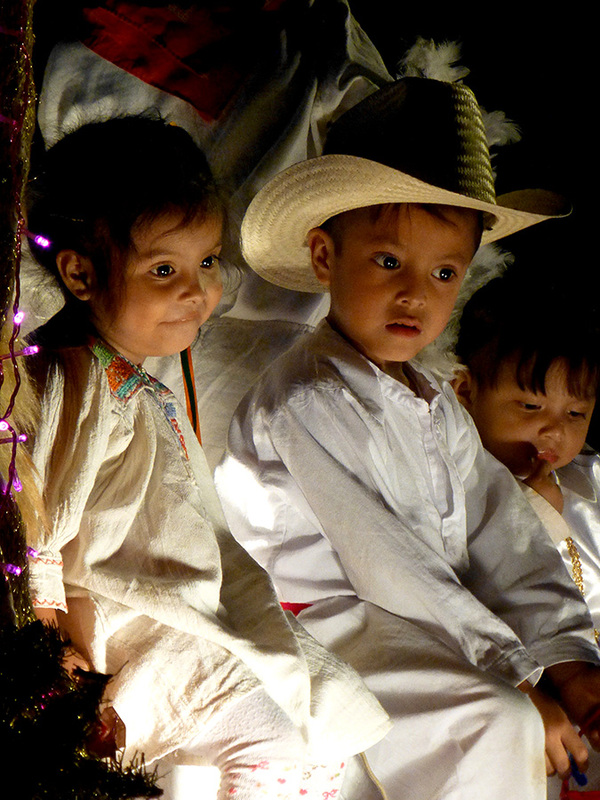 September brought the second major feast day in Teotitlán del Valle: Fiesta a la Natividad de la Virgen María. 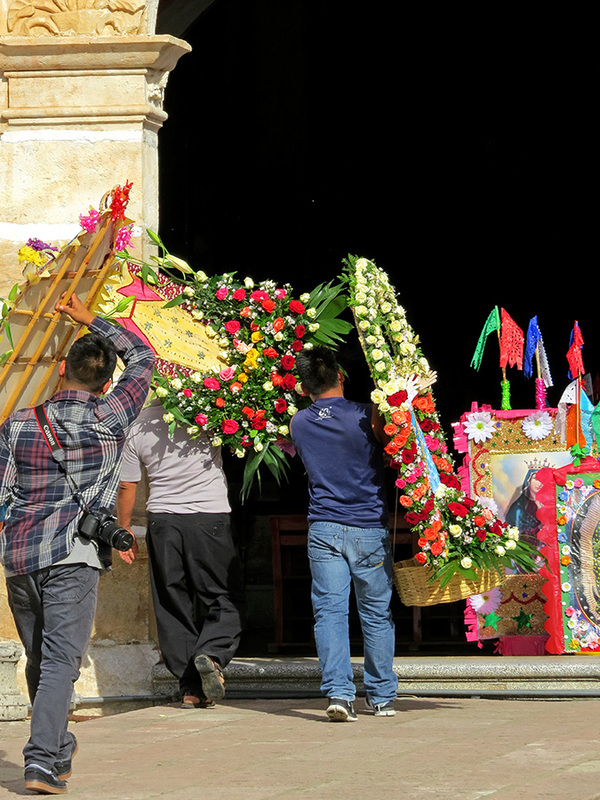 Bringing canastas to the church for the unmarried women and girls to carry in the convite. 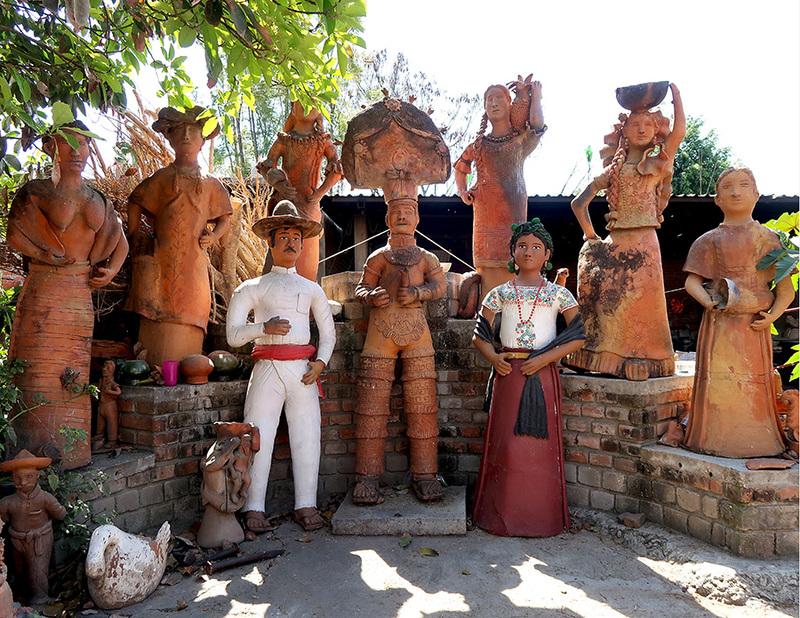 I was in California from late September to early October, and when I returned there was a new exhibition in the courtyard of the Museo de Arte Prehispánico de México Rufino Tamayo. 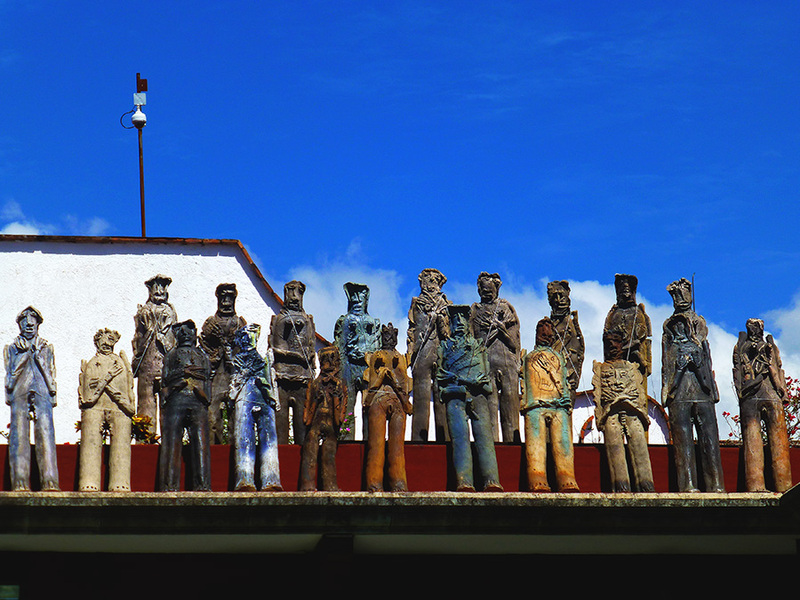 Some of the 2501 migrant sculptures by the late Alejandro Santiago. For the past couple of years, one of my destinations on November 1 has been the panteón in Tlacolula de Matamoros; its beauty and tranquility always take my breath away. 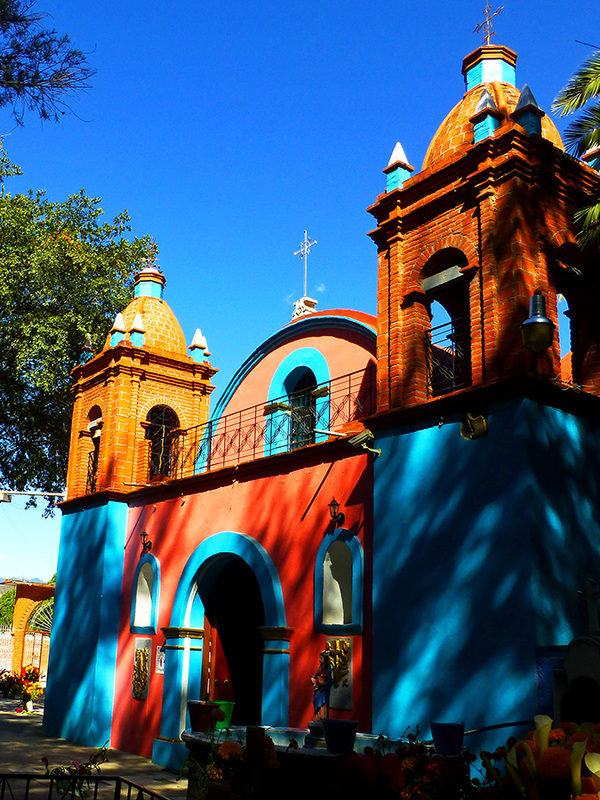 Light and shadows cast by the daughters of the Tule tree, play off the colors of the chapel in the panteón. 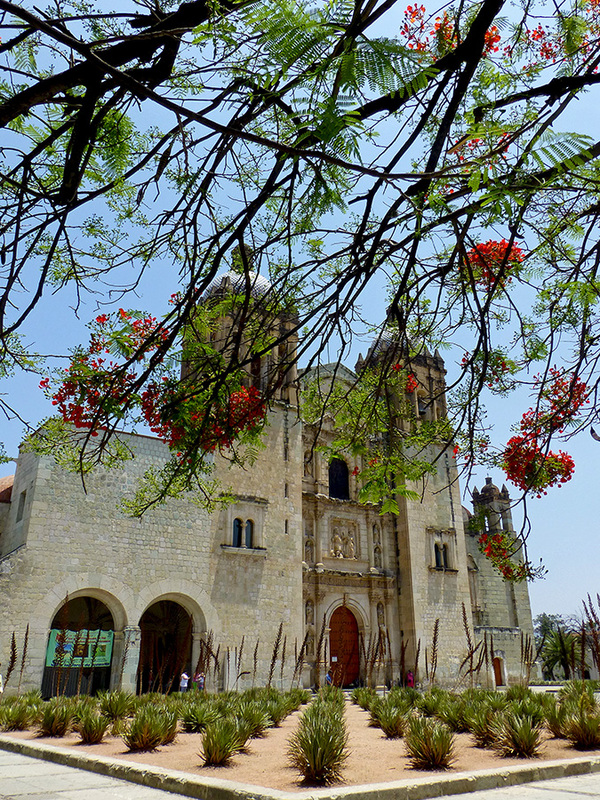 Later in November, I spent a delightful Thanksgiving with family and friends on the east coast of the USA, but returned to spend Christmas in Oaxaca for the first time in three years. It was just as joyous and colorful as I remembered! Nochebuena angels on a float in the zócalo. These three are the future; let’s vow to do all we can to give them a better world than the 2016 one that is departing. Many thanks to you all; I am constantly amazed and gratified that you choose to stop by. Wishing all the best for you, your loved ones, and your communities in 2017. ¡Feliz año nuevo a tod@s! How doth the little crocodile? 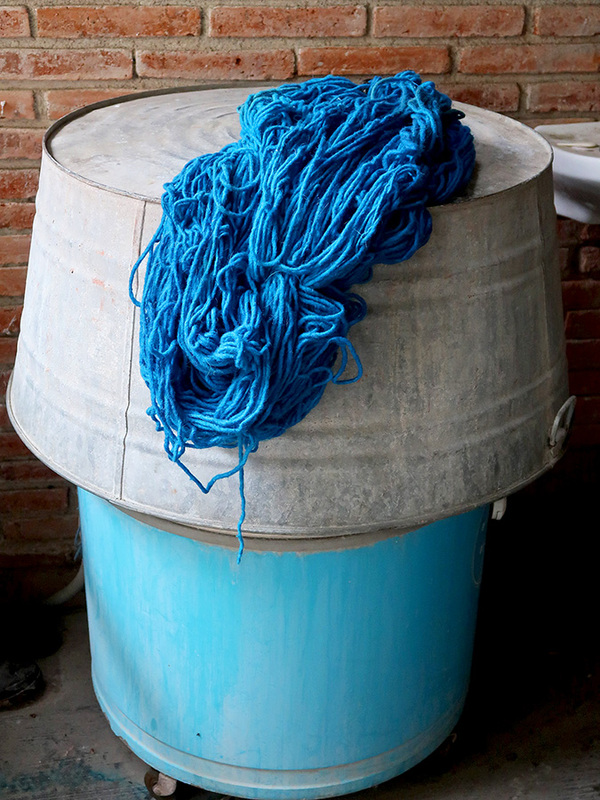 Today’s Google Doodle solves a little mystery leftover from my brief March visit to Mexico City. 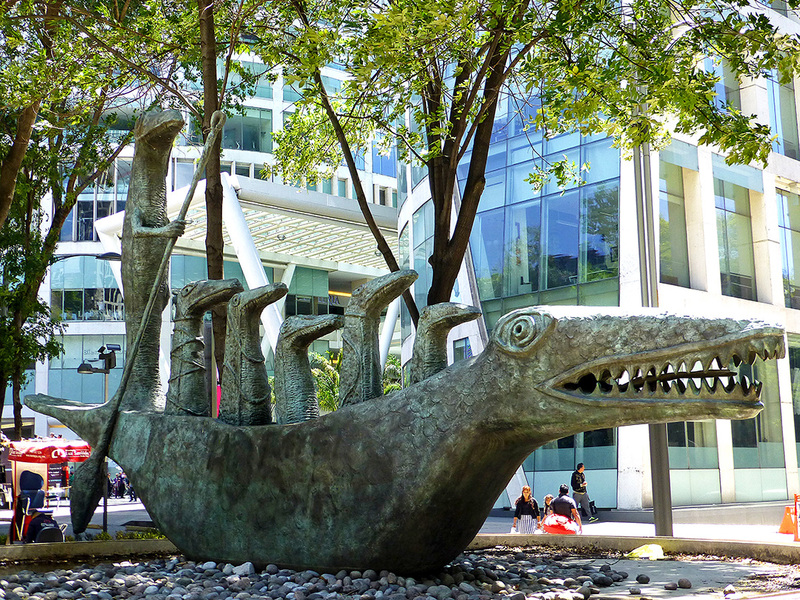 Staying in Colonia Cuauhtemoc, making my way to Insurgentes metro stop took me across Paseo de la Reforma and past this beguiling sculpture. I circumnavigated the sculpture on several occasions in an unsuccessful attempt at finding a plaque identifying the artist. Thanks to today’s Google Doodle, now I know. Titled, How Doth the Little Crocodile (also known simply as, Crocodile), it is by the late surrealist artist, writer, expat, and women’s liberation activist, Leonora Carrington, whose 98th birthday is being honored today. 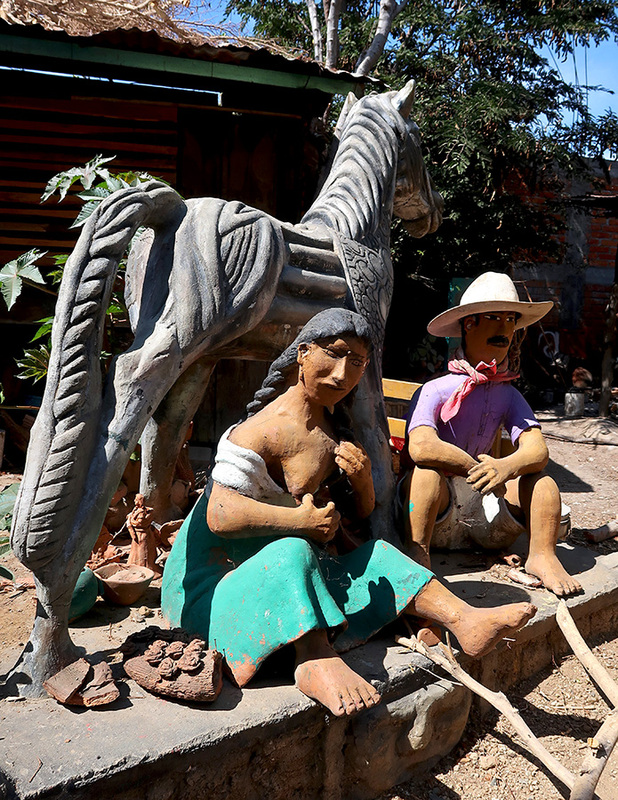 The sculpture’s title comes from the Lewis Carroll poem by the same name. Carrington led an extraordinary and fascinating life that was touched by many of the most important events and influential people of the twentieth century. 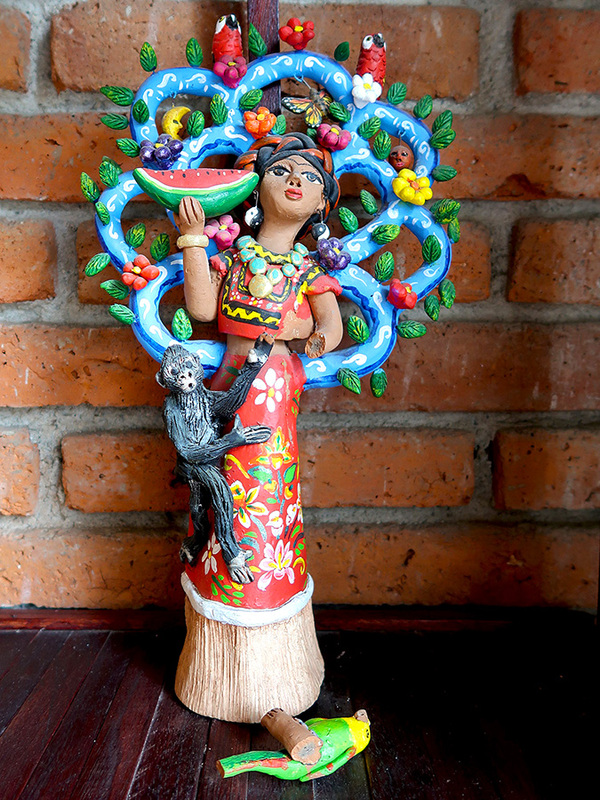 In 2000, she donated the sculpture to Mexico City, her adopted home for the latter part of her life, and it was moved to its current location in 2006. How lucky for all whose paths cross this whimsical creation with its smiling jaws! It’s been a great visit to Mill Valley, California, the town where I grew up and lived most of my life. 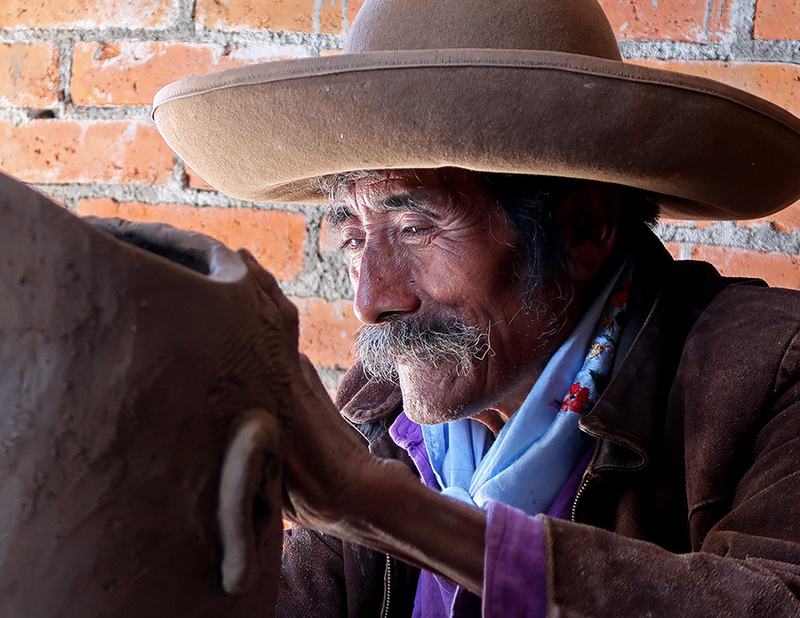 But, I’m ready to return to Oaxaca. However, besides differences in latitude and attitude, there is much they have in common. 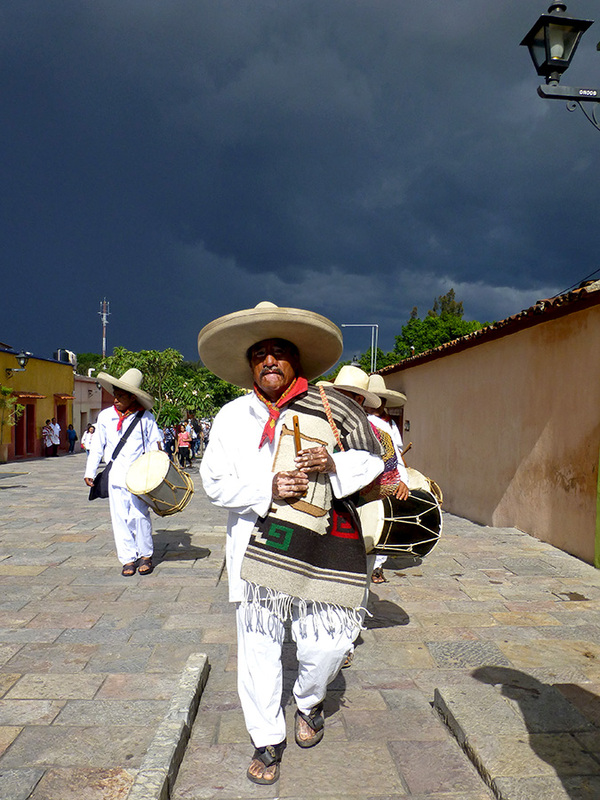 On the Alcalá in Oaxaca. Side of a building on Shoreline Hwy, Mill Valley by Zio Ziegler. Side of building on Shoreline Hwy, Mill Valley by Zio Ziegler. Tunnel leading to Guelaguetza Auditorium, Oaxaca. AND, there are signs reminding drivers to wait and take turns. Remember my What’s easy??? post from last week? Look what just went up in Mill Valley. Discourteous drivers know no boundaries! Street sign in Mill Valley. Rather than dwelling on the differences — which I did when I first began living this dual-country life — I now choose to appreciate the similarities. Of course it doesn’t hurt that both places are situated in beautiful settings, fresh fruits and vegetables abound, have relatively mild climates, and an appreciation for the arts. 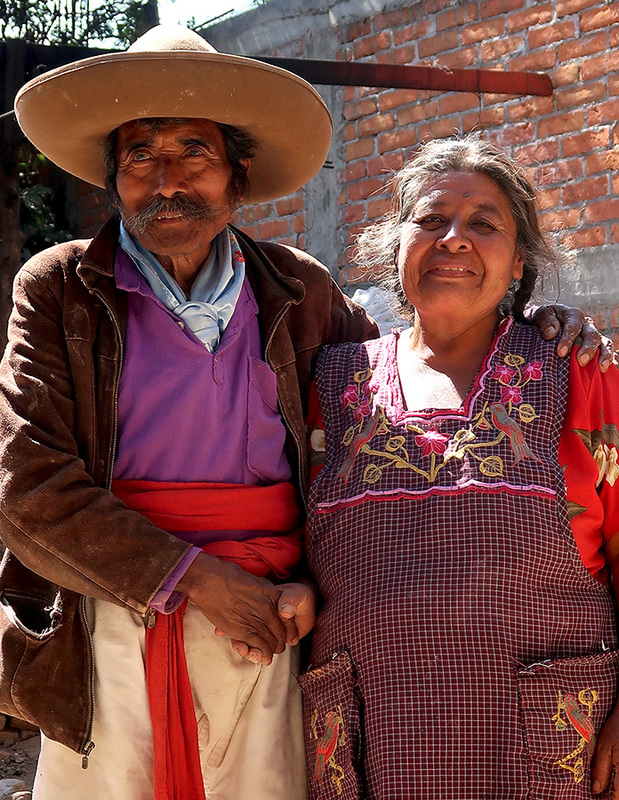 And so… I bid a fond “adiós” to Mill Valley and “hola” to Oaxaca. 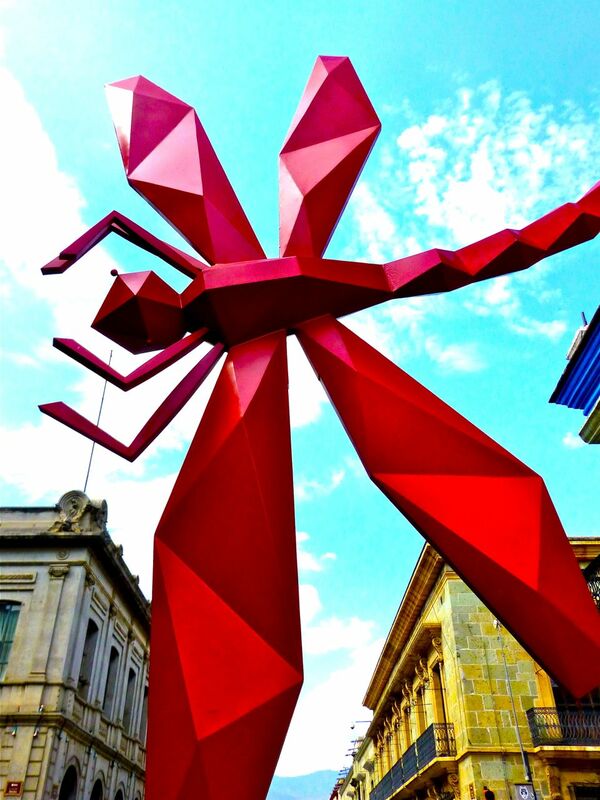 No, not a newly discovered mutant killer variety — only one of the sculptures currently hanging out along the Alcalá. 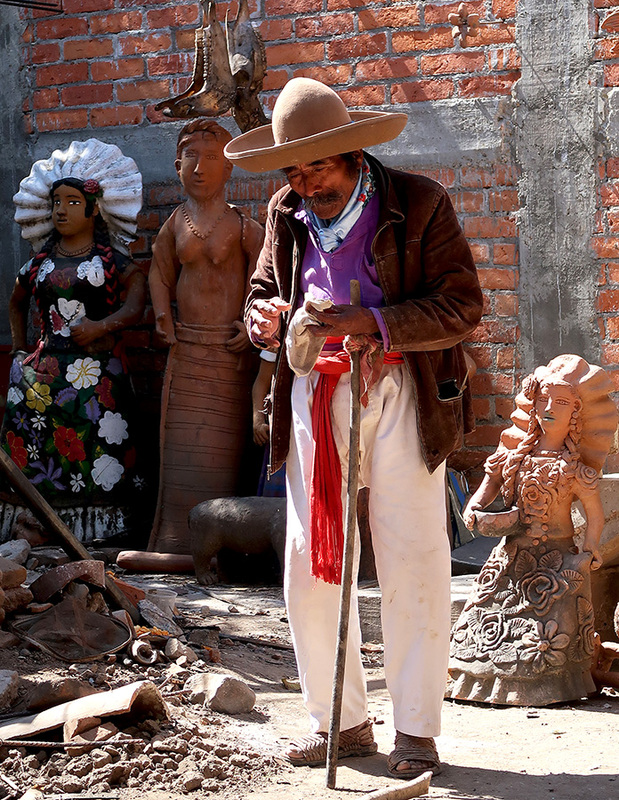 It is part of a public art exhibit, “El migrante,” by Oaxaqueño artisit, Fernando Andriacci.